EXO’s cutting edge looks are obvious. But pick it up, and certainly, you’ll know you’re holding something very different. Mostly because of what’s not there. 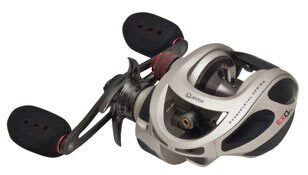 At only 5.9 ounces – the exoskeleton aluminum frame and side covers provide a reel that is almost 40-percent lighter than the most popular baitcasting reels we fished with just five years ago. Bagby, a straight-shooting personality with an engineering degree, took a see-for-myself approach to EXO. After engineers put it through the rigors of Quantum’s exclusive PT Test Lab, Bagby took EXO prototypes to the parking lot outside his office door and purposely ran over it with his pick-up truck. No failure. Nothing bent. Toughness test passed. But don’t try that at home. Speaking of cast control, a seven position internal cast control dial allows anglers to select the exact amount of braking they desire to match exact casting conditions. EXO is offered in super-fast 7.3:1 ratio, as well as a mid-range 6.6:1, and Kevin VanDam’s favorite 5.3:1 crankbait set-up. EXO retails for around $249.